N20 updated turbo oil feed line you can see on the new oil,,,,the 1 way check valve to stop oil feeding the turbo while its shut off. You have to remove the turbo ,,,because the oil line is behind the turbo this is a pic of the old oil line,,,,,no check valve,,,,,,what happens is that during cold start up the customer could see smoke coming out the tailpipe,,,,the major problem is the turbo oil feed line,,,,,,when the engine is shut off and sits for long periods of time,,,,,,the oil keep draining from the engine into the turbo,,,,causing to much oil inside the turbo during cold start and blowing past the turbo seals,,,,causing the smoke out the tailpipe. 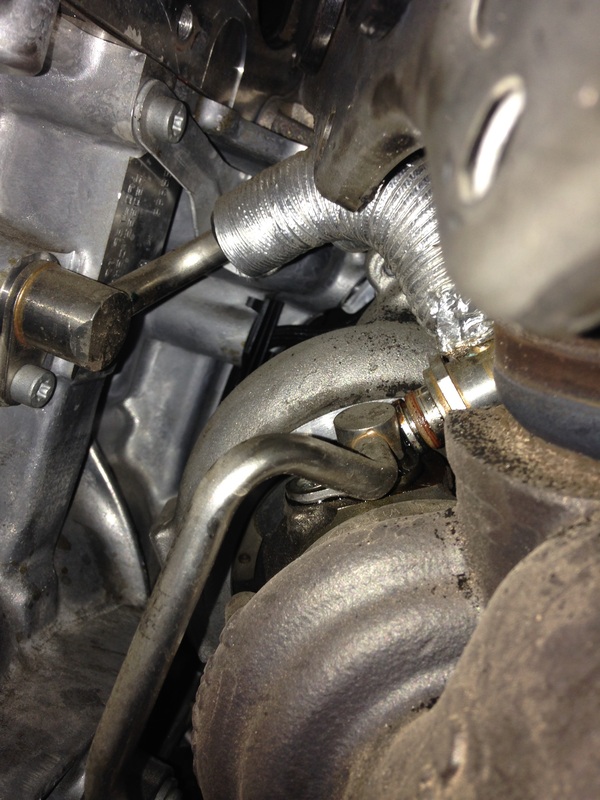 This entry was posted in Uncategorized and tagged N20 turbo oil line, smoke exhaust. Bookmark the permalink. 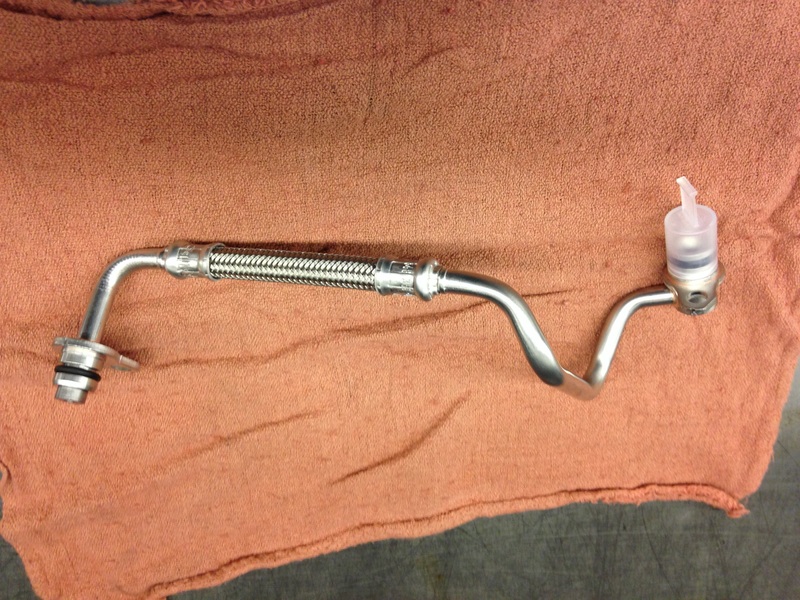 Is this a recall item performed by the dealer or is this out of pocket expense by the owner? Sorry I don’t have the part number,,,that special oil line is only released from BMW only,,,,,I have to make a PUMA case,,,a PUMA case is a group of BMW specialist who we have to get authorized to replace special parts,,,,that oil line is only released from BMW,,,,,it is not a part you can order at this time,,,,,,why what’s wrong with your car? No sorry,,,like I said that part is only release from BMW per PUMA case,,,,you would have to have a dealer submit a PUMA case with a problem with your car,,,,,the dealers don’t have permission to release that part. 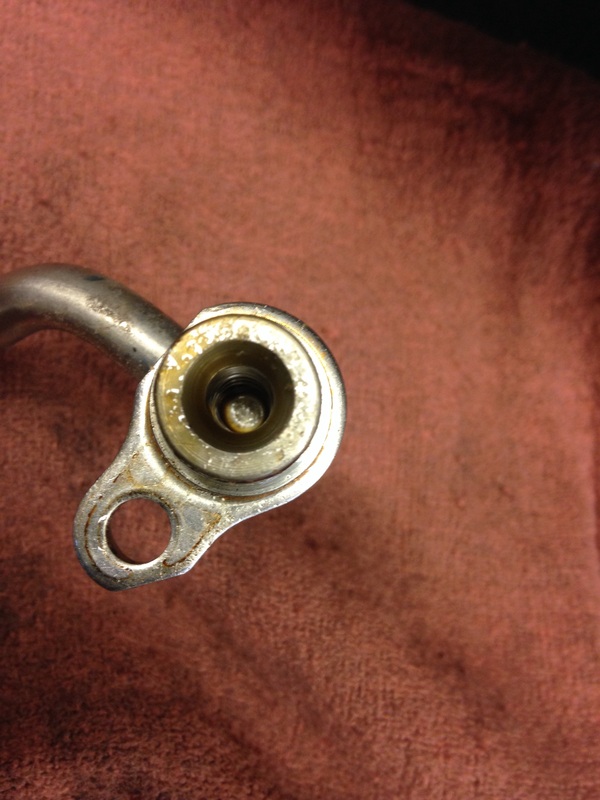 I thought i had worn valve stem seals at first, after seeing this I have replaced the oil feed and she’s good as gold. Do you happen to know what model year they began using the new line with valve? Oh good question,,,,,no I don’t know what year the new oil line came out,,,,I would have to look in to that. Hi … thanks for the details here, very helpful!! Would you know what could cause this? Per my mechanic I need to replace N20 turbo line and I am curious what cause this. He saying this is labor intensive task – cost of parts is not too high. Hello. I just purchased a 528i 2013 with 42,000 miles it also smoke at start up after it sat for 3days called the dealer and they said it was condensation. I let the car sit again at start up it did the same thing and it wasn’t condensation will take it in to the dealership. Up date on N20 smoke on start up the dealer replaced the oil in feed line to the turbo. How can I find out if my 2013 528i has the timing chain issue does it go by year or do I look to see if it makes noise. It goes by the noise,,,does your car have a load whine noise while revving the engine,,,,that is the sign that the timing chain is going bad. I have 2013 X3 with 86000 KM and started emitting white smoke at start up. It was really bad when the car was idle for 3 days. I took the picture and showed to the service advisor and was told that they are going to replace the turbo feed oil line. Will that solve my issue? My timing chain and oil pump chain were replaced last week. With all these change will it be wise to keep the vehicle as I would like to enjoy the vehicle for at least 2-3 years. Please advise. Yes the turbo oil line should fix your problem,,,,after this repair you should be all done with problems,,,,let hope,,,the timing chain and oil feed line were the 2 major problems with that car. Thanks for the reply. With all those changes have been made and do you think it is safe to keep this vehicle for another 2-3 years without warranty..please let me know your thoughts. People with the same BMW car engine need to read this blog. I have 2012 X1 with the N20 and have the same problem. The dealer however gave me the run around. I’m still trying to see if the Turbo line will go on the emission warranty. I doubt I’ll get anything from the dealer since I’m just over the warranty period. I’ve been to two different dealers in National Capital region and got two different quotes for the same work. They made me waste my time on two visits to finally leaving the car overnight for them to see the cold start smoke. Then they came with a timing chain and oil pump problem plus the turbo line…a total of $6,333.83 with taxes. Don’t worry I wont get it done…I’ll live with the problem and add oil if necessary. Hey people need to see another smoking BMW on the road, with the blackened exhaust tip. Maybe it will make people think twice. Hi, I’m from the unofficial northern state called “Canada” (joke!). Lot’s of X1’s around this area on the road due to the winters (SUV’s are really popular). By the way I love your blog, I was excited to find it and (even though my current experience with BMW dealer) that you had explained all the symptoms of my vehicle so clearly. Thank you for that and keep up the great work!! I did a quick check on the emission warranty and it appears to be 4 years/80,000km here in Canada. It a 2012 X1 with 80,000km (just turned this week, go figure!). Do you know if I can request some financial assistance from BMW? Any alternative? I have a 2013 X3 28i with 54K km on it and have exactly the same issue. I’m from Canada, too. Dealer replaced the turbo oil line but the car still smoke. Dealer won’t replace the turbo saying the white smoke is not big enough for BMW Canada to approve the work under warranty. Would the oil in the turbo clear itself overtime? What would be the long term effect if it continues? No the oil will not clear out over time,,,,the problem will just get worse over time. Help please, took my 2013 740Li for front bumper repair at a BMW Dealer. 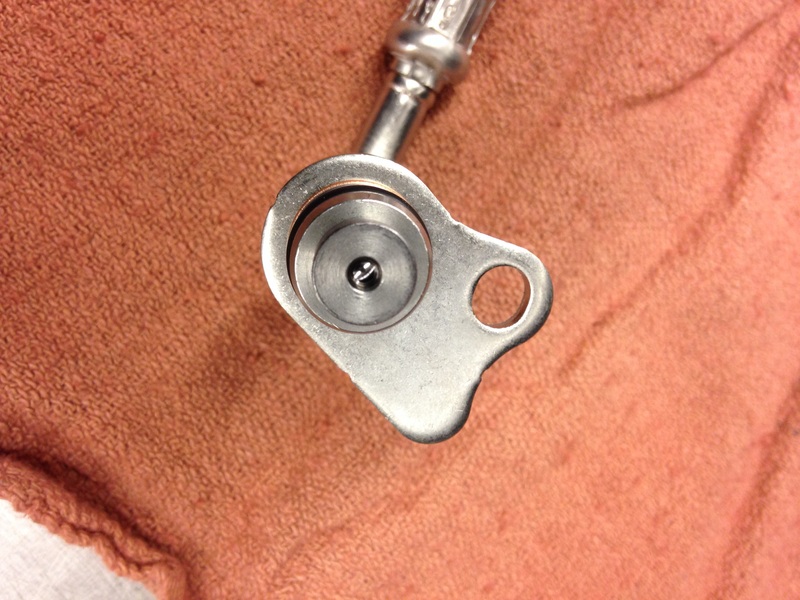 After repair a fault check revealed AUC Sensor issue in which the sensor was unplugged. The dealership plunged the sensor in and my battery died and would not charge beyond 4 percent. Because my battery according to the dealership was the original battery I opted for replacement. After which I was notified that my car would not stay running, I’m now getting the runaround and they are trying to get out of fixing my car. They looked into the history of the vehicle and learned that in July 2016 the dealership removed the cowl and performed work on the climate control and I remember that the only work performed was the hard drive for Navigation and a trunk spring recall. But I do remember that they had to recharge my battery, installed a bumper camera so I don’t understand what’s going on here. Now I’m told the CAS Module might be why the car will not stay running. I have a list with the codes that I would like to forward to you if possible. Not able to add them to this blog. Bmwtechnician Helppppp! LOL I recently purchased a 2013 BMW x3 with 26000 miles on it from a non Bmw dealer. It started smoking on cold starts very shortly after that, or that is when I noticed it. I took it to BMW and they said it needs a turbo oil feed pipe and ordered one. The next day the car said low oil pressure stop carefully, I pulled over and the car died. Now the Bmw dealer has had the car for a week and said a lobe broke off the cam and it’s due to not changing the oil. They only show oil change in their system at 22,000 miles. They now say it’s not covered under warranty and it’s 18000 for a new engine. My question is can the oil feed pipe cause any of this? Second how can they prove that there is only one oil change and that is the cause of the problem. Help!!!!! Thanks for the video,,,,the video is hard to tell what’s going on,,,,you should make the video just standing behind the car and watching the exhaust ,,,the good news is that I saw water dripping out the exhaust which tells me it’s condensation . Hi I had a similar experience last week, my car always used to be smoking on cold starts. I bought the car used and was unaware of the recall. Got my oil change down for the first time with a BMW dealership and the next day the car said engine oil pressure stop carefully, I pulled over and the car died. Now the Bmw dealer has the car and said engine has grooves and pits due to low oil leading to low compression over time. My car is currently at 62000 miles, I contacted BMW NA and am hoping they will help me out. I was not even aware there was low oil. I want to ask again if the oil feed pipe cause any of this? I have all the records on carfax for service. its a 2013 328i xdrive. I am hoping to get your opinion on my situation. Please Help!!!!! Is your car due for the turbo oil line recall,,,,,and it wasn’t done,,,,,yes that can cause low oil. Yes it’s due. I’m a new owner of this used car, got it 6 months ago and was never intimidated about any recall nor did any error messages pop up in car displaying low oil. My service rep as well as BMW confirmed it was in line for recall on Thursday and car died on me on Friday morning. I was planning to get it done today Monday. BMW is looking into my escalated case though it’s not in warranty how should I take this forward? I’m extremely upset about this. Thank you for your prompt response, I really appreciate it. I am waiting on BMW to let me know the outcomes of this investigation. So as far as I understand, the turbo feed line [old] fed more oil into the turbo even when turbo was shut off which lead to low oil within the engine causing low compression? Does the same turbo oil feed line feed the engine too? Please correct me if I am wrong, I want to have a strong case to present to BMW if the turbo oil feed line is the root cause. The engine grooves are damaged and pistons not operational that’s what the dealer said. I spoke to BMW they agreed to pay 50% for the repair cost, with all costs I guess it will cost $20k. I am not looking at spending $10k to replace engine, any idea how to source used or remanufactured engines? What do you suggest I do? BMW NA is not willing to budge from the price. I have a 2012 Bmw 528i that recently started doing the smoke at cold start up, but also noticed my engine temperature rises from 215 F to 245F when running at 70mph. Is this something to be concerned about? Thank you for the feedback. Is the temperature I pointed out a pretty normal temperature range, while driving on a 90 degree day? I also noticed that the smoke is white at times, but smells like gas and not burned oil, then clears. It doesn’t do this all the time at cold start, but just started a week ago. My car has approx. 84,000 miles. The temperature sounds about right,,,you said it smell like gasoline,,,,if that is true then you might have a fuel injector that is starting to go bad. Hi BMW Technician, I have a 2013 X1 N20 with 110,000 miles that has the oil cloud on start-up problem. I’m a fairly high level do-it-yourselfer, how difficult is removing and replacing the turbo? Have you seen any written or video info on how? It’s alittle on the difficult side,,,,you do 80% of the work from under the car,,,,you actual just pull back the turbo to gain access to the oil line so you can remove it,,,,,there is no need to completely remove the turbo,,,,just unbolt it and lay it on it side against the engine compartment so you can unbolt the oil line. Another problem we have quite often, after a short stop like getting gas, the half engine light symbol comes on and the car goes into limp mode for a short time. It never happens on cold start or while driving. Any thoughts? No it’s hard to say what’s going on without scanning the car and checking for any faults in the system. I too am dealing with the Smoky starts. You said earlier that there is a recall for the Turbo Oil Feed Line? I have a 2013 X3, 28i, 60000 miles…original owner. Yes there is a recall,,,,but it only covers certain cars,,,,you can ask your local BMW dealer and they will let you know if your car is covered. I found the feed line, it has the code: 11428678840. But i did not find the rest of the needed parts, can you help me with the codes? It will help me a lot. Did i find the corect parts? O-rings = 07119907330, exhaust clamp: 18307606136, exhaust gasket: 18307581970, exhaust nuts: 18307525607. Do you happen to know if this applies to the N26 as well. I’m having a similar issue. Big cloud of smoke right after cold start. Mine is under warranty but I definitely want to to as much as I can so I don’t get a “everything seems fine” from the service guys. My car is a 2014 428i xDrive F32 N26. I appreciate the reply. They have had my car for 2 days now and I’m getting suggestions that it is just exhaust. They have even seen the video but told me they could not replicate it the next morning although it has happened every morning to me for the past week and a half. I also told them it definitely smells like oil when it happens. I wish I could attach the video but it sticks around in the air for a while and from my understanding, typical exhaust dissipates pretty quick. Is the fact that they couldn’t replicate it simply because the car was barely driven at all the day before? They finally replaced the oil feed line. But I still have an oil consumption issue. Something I have already brought it in for and they said they couldn’t figure it out/didn’t see any leaks. The problem I have been having has to deal with a long distance drive. In my case I travel to visit family from NC to MD. Today I had the same issue going for the holidays. Every time I travel around 100 miles I get the Low oil warning. I added the quart like it said then I get the same message 50 miles later. Have you had any experience with this type of issue? This thing is killing me man. No signs of external leaking either. Called the service depertament and the suggested to drive while it was yellow and if it turned red then it was an oil consumption issue and not a faulty sensor. It turned red after another 100 miles right before I arrived. No I haven’t had any oil consumption on a N20 engine,,,,you need someone to check the vacuum pump vacuum lines and brake booster line for any oil inside the vacuum lines,,,,sometimes the vacuum pump will pump oil inside the vacuum lines,,,,next has anyone checked the spark plugs for any oil burning,,,,next you need to start with a fresh oil service and monitor the miles until the oil light comes on ,,,,then have someone check the oil level and see how much oil you have lost. Hi, i had my turbo replaced on my 320 f30 2000 mile ago due to oil leak , the car now is doing 100,000 mile ,, today i noticed on the bolts bottom left side of the engine some oil , i have pictures of it , i want you to see it please .. Can this be caused from the old turbo or while replacing it the oil appeared ? Thanks so much for your quick response , really appreciate your help. Hi there. I am in California and have a 2013 320i (non sulev from what I can tell). My dealer is stating the turbo oil line needs to be replaced but they will not replace under warranty (I am currently in first year of CPO coverage). Just checking to see if this is correct. I have been doing a lot of reading up on this and I don’t see a lot of info in the 320i. Thanks! Hi, I have X3 20i, 2012, live in SA is on 90000km. The car started smoking on startup I took it to local BMW and also asked to bring the videos, it only does this if it stays for 3 to 4 days that is why they couldn’t see the smoke. I checked under the car for oil the cover looks oily moist. How long can these last before it damage the turbo. Hi, is the turbo oil feed for 20d and 20i X3 needs upgrade. Or only petrol engines. You said you refurb the vanos gears what does that mean? ,,,,it sound like when you cleaned the engine sludge it is now clogged something maybe the vanos solenoids or the vanos gears are now binding,,,,you might have to flush again and perform a oil and filter change,,,,something happen after you refurb the vanos gears and flushed the engine. Hi, my F30 320i Dec 2012 model with n20 has white smoke (with oil burning smell) during morning cold start up. The white smoke will last about 5s or so, and no more white smoke after that. Car mileage is 105k km. I have the top 1 liter of engine oil every 4k – 5k km thing as well. Thanks. Understand it’s a 5-hour job. Does it involved removing the turbo or the exhaust? I have 2 workshops where one is saying have to remove the turbo and the other, remove the exhaust. I had my car checked and the mech told me that the brake vacuum pump is leaking. Should I changed it for the OEM (BMW original) which cost $440 or aftermarket at $100. I understand the labour cost to change the brake vacuum pump is high. I would go with original if you can,,,,if you have a N20 engine the labor should only be 1.5 to 2.0 hours to replace.